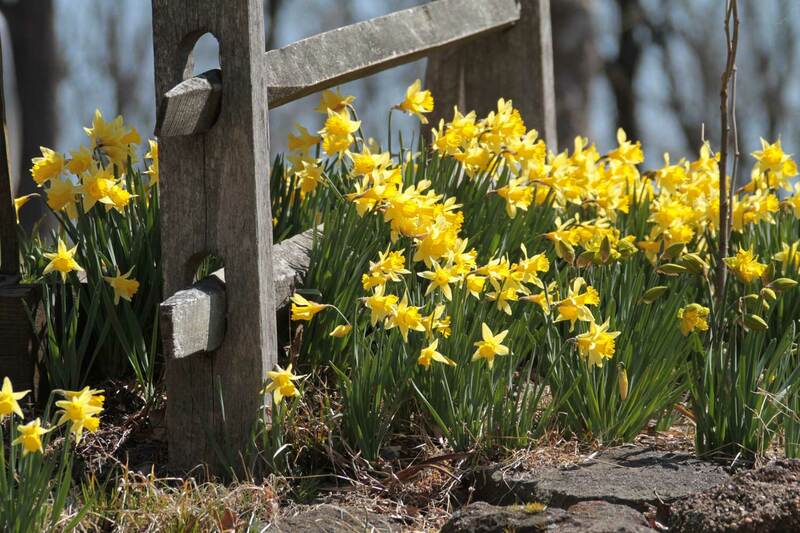 This guest post about daffodils was written by Melinda Myers, nationally-known gardening expert, TV/radio host, author & columnist . Daffodils are probably my favorite spring flowering bulbs. Their cheery color, animal resistance and versatility makes it easy to incorporate them into any size landscape. Plus, the variety of bloom times gives you flowers for the entire spring season. 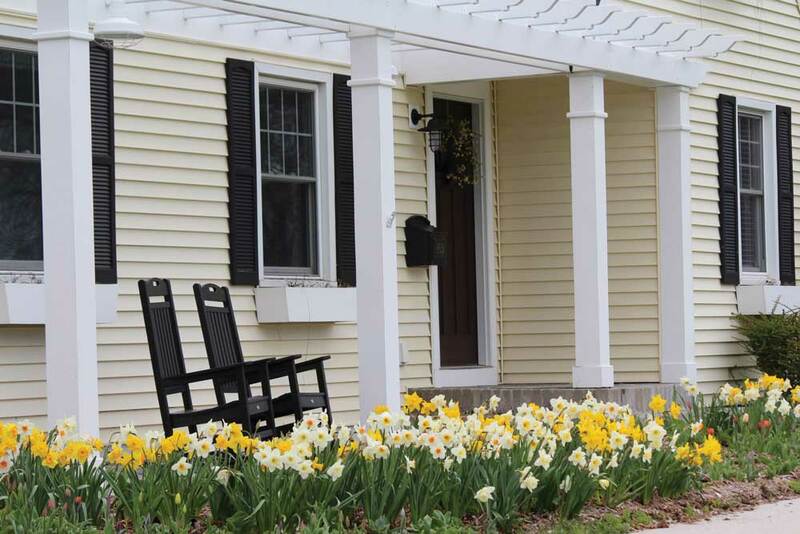 Welcome friends and neighbors to your home with a colorful display of daffodils. Planting bulbs near your front door will lift the spirits of everyone who passes by. You can start with just a few bulbs, and as they multiply your home will become known for its beautiful display of daffodils. When I was gardening on a small city lot, I used midseason daffodil varieties in a shady spot along the front of my house. The bed also included hostas and Virginia blue bells. As the daffodils and Virginia blue bells faded, the emerging hosta leaves helped mask the declining foliage. I also like to combine daffodils with daylilies since the foliage is similar and both plants are equally assertive. 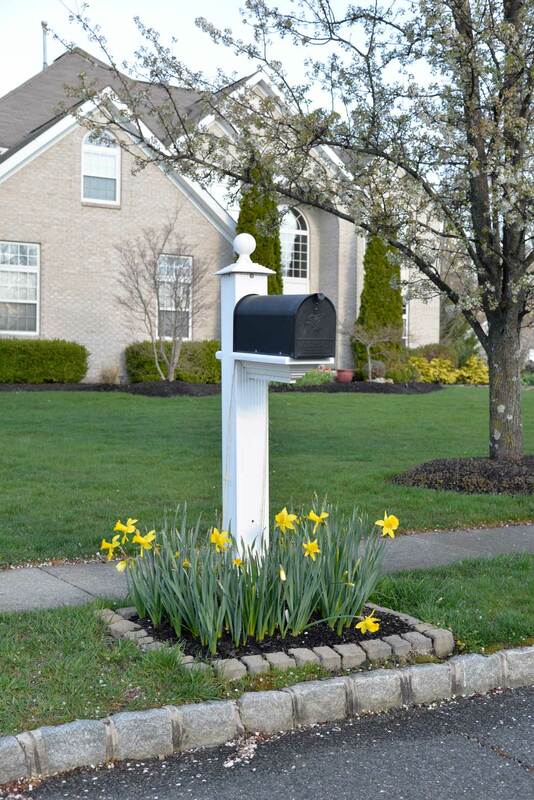 Welcome spring and your letter carrier by planting a few early-blooming daffodils around your mailbox. It will make collecting the mail (bills and all) a highpoint of the day. Add a few perennials to the area to keep the living welcome mat blooming throughout the growing season. Enliven forlorn or forgotten places such as the strip of land between the sidewalk and the road. Over time, the bulbs will make themselves at home and spread throughout the area. Choose varieties that are good for naturalizing, such as Dutch Master and Ice Follies. Or add variety by planting an assortment. You will enjoy the colorful welcome and passers-by will appreciate the garden you created just for them. Choose fragrant varieties for planting near your entryway or patio. You’ll enjoy the aromatherapy of sweet-smelling flowers such as Pipit, Beautiful Eyes, Actea and Sherbourne. Be neighborly and plant some bulbs beside a fence or along the lot line. Include a variety of bloom times and colors that will complement your neighbor’s landscape as well as your own. Adding flowers along the lot line is a great way to build relationships and shared memories. Improve your view. My breakfast nook looks out onto a mulched hillside where I am growing peach trees. Last fall I planted several hundred daffodils on this hillside. I enjoy the view each spring morning while sipping my coffee and preparing for the day ahead. I plan to add more varieties every year until this large space is covered with blossoms from early through late spring. 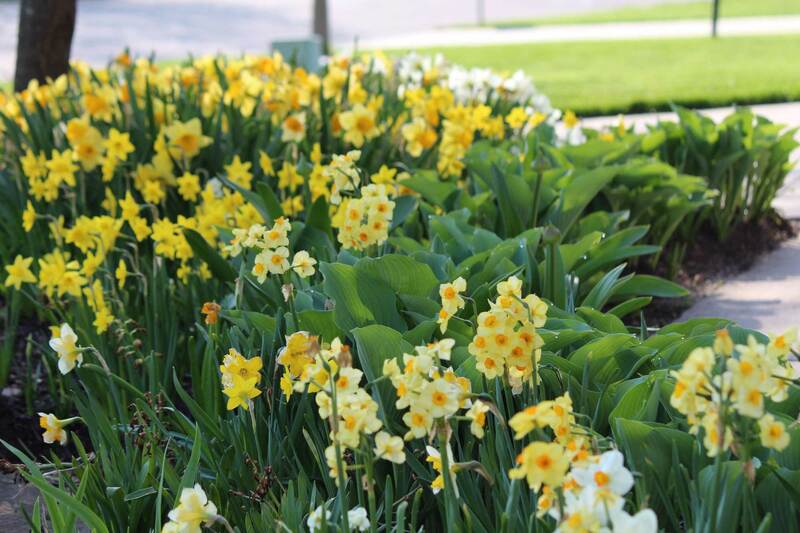 Add early season color to shrub plantings with miniature daffodils. At just 8 to 10” tall, these bulbs are easy to tuck into small spaces. Varieties such as Tete a Tete and Baby Boomer have slender foliage that fades away quickly after flowering. Consider planting cold hardy pansies along with your daffodils for extra color in both fall and spring. Pansies will survive the winter even in most northern areas. They usually begin blooming just as the daffodils start to emerge. In milder climates, pansies continue flowering right through the winter. Dress up outdoor workspaces. Plant daffodil bulbs near your compost pile, outbuilding or other areas that often get overlooked when it comes to landscaping. These unexpected bursts of spring color may motivate you to tend the compost pile, organize the shed or will at least take the sting out of the work that needs to be done.Add a few daffodils to your cutting garden. Look for those unique varieties with double or split cups. Doubles like Double Smiles, Cheerfulness, Delnashaugh and Tahiti provide great impact in the garden or bouquet. Cassata, Lemon Beautyand others with split cups are sure to grab your attention in both garden and vase. 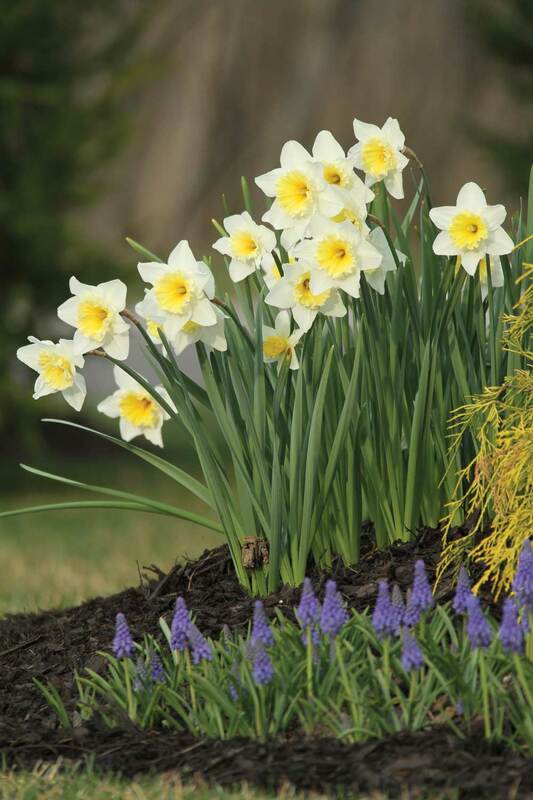 Combine daffodils with other spring-flowering bulbs. Select types that bloom at the same time to create multiple layers of color. Siberian Squill, Grape Hyacinths, and other minor bulbs are excellent partners for naturalized daffodils. 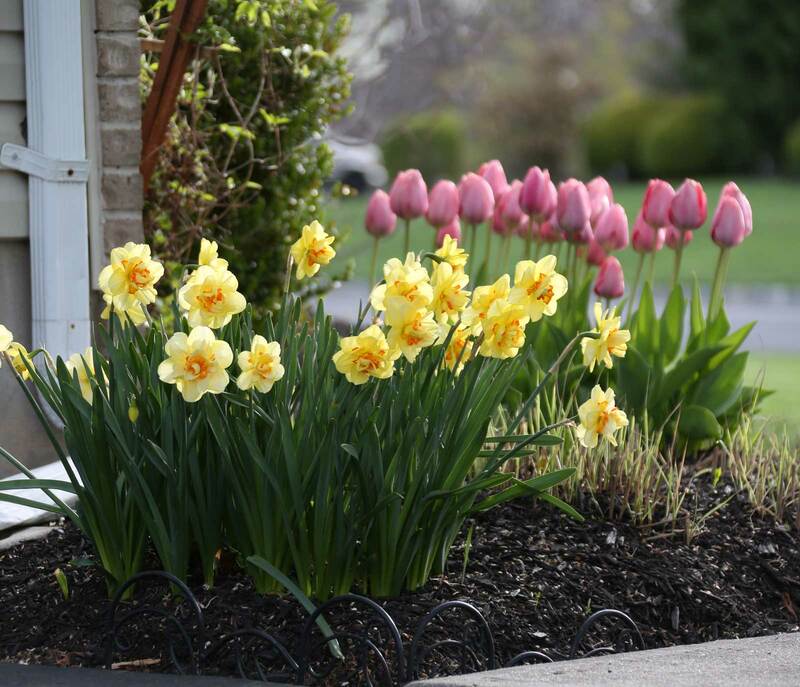 When planting tulips, add some daffodils to extend the floral display. As you can see, the possibilities are endless. 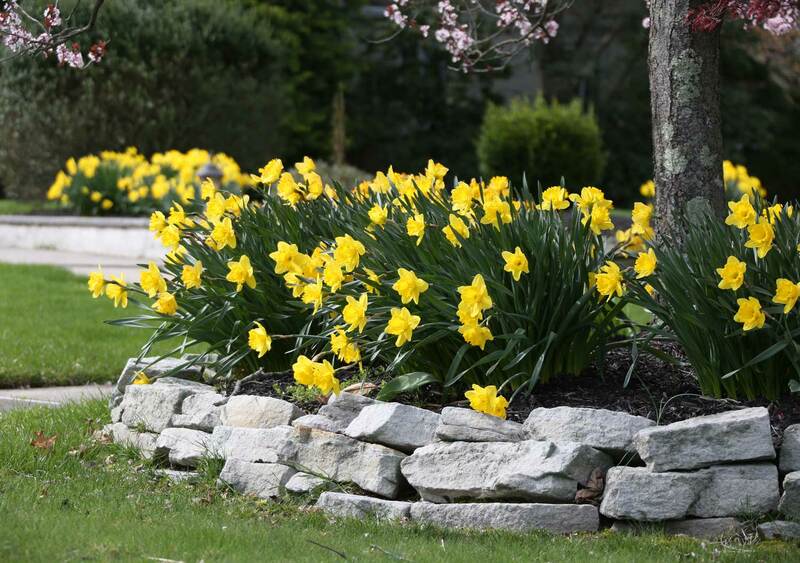 So order plenty of daffodils this fall and uncover some new places to add spring color to your landscape. Click HERE for more gardening tips and ideas from Melinda Myers.